In Flash Vol. 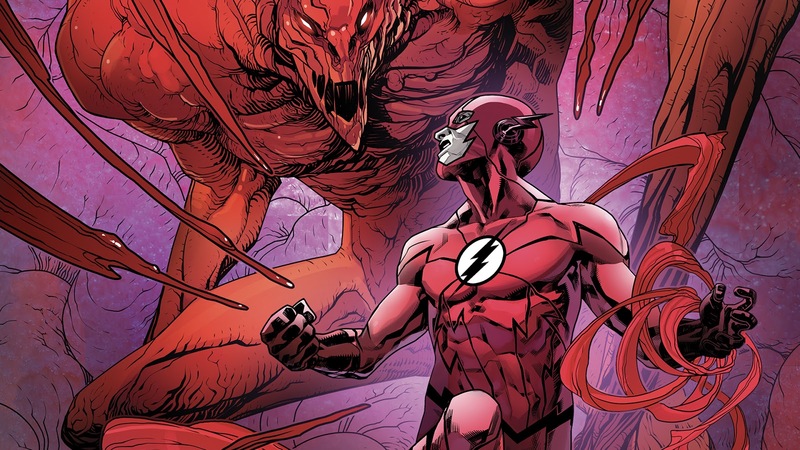 5: Negative, Barry Allen is dealing with the fallout of his battle with Reverse-Flash. Barry stole his speed after he tried to lock him in the negative speed force. This results in him becoming Negative Flash, with powers stretching beyond his control. 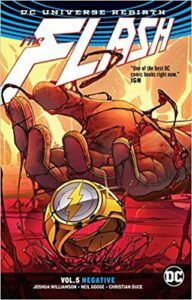 In this volume, someone has been stealing from the evidence locker, and Barry Allen is tasked, along with some of his colleagues, to find out who and why. An investigation that leads to the discovery of an original villain from an unlikely place. Before writing Flash, Williamson was well known for his horror books, Ghosted and Nailbiter, over at Image Comics. Here in Flash Vol. 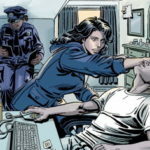 5, Williamson gets to showcase his knack for horror. Now, this series has been horror-tinged from the start, but it seems to have gone up a notch here. The first page sets the tone with its heavy inks and mysterious characters colluding to send a message to Flash…something that isn’t really addressed again until a shocking last page reveal. The very next page starts off an action sequence where Flash chases the Road Reapers, a biker gang of thieves. At the end of the pursuit, we are shown the destruction left in Flash’s wake, which comes as a result of him being unable to control his new powers. I’ll be honest, I’m fairly new to comics. My first introduction to Barry Allen is the CW TV series, and his appearances in Geoff Johns’ New 52 Justice League. 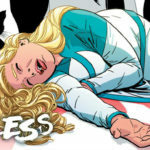 I feel like DC is taking the popularity of the TV show and somewhat guiding the narrative in the comics. From the rogues gallery to the black Wally West/Kid Flash. I think they have a stuck a really nice balance between integrating certain elements from the show and presenting an original comic story. It’s certainly helped this reader to not feel lost along the way. Back to the writing…I like the new status quo that Williamson has given Flash. I like how the aftermath of becoming Negative Flash, Iris learning Barry’s secret identity, and Iris subsequently killing Thawne, has forced him to rethink how he goes about not only being a superhero, but also as a human. This has put a strain on his relationship with Iris. In fact, we don’t even see her in a single page the entire book. I struggled a bit with the art throughout this book. Now, I am not harping on any of the many artists’ abilities, but rather the fact that there are so many artists on this book. I felt a little discombobulated at times with each chapter having a new different creative team. I thought they all had their strengths, but struggled with the constant changing. I liked the coloring, for the most part. However, there were several panels during the fight scenes between Flash and Bloodwork, both being red, that seemed a little too well, ummm, red. LIke, reeealy Red. It stung my eyes a little. And can we talk about the viallain’s name real quick? I know it is a terrible name, but he did have a decent background story, and abilities that frustrated our hero. But, seriously? Bloodwork?! Anyways, overall the art was fine for this story. I did miss seeing Howard Porter on this volume, but I did appreciate his collection of variant covers in the back. Can we get him as the full-time Flash artist? Please? Flash Vol. 5 ends with an 8-page holiday backup story where Flash carries people stranded at the airport to their homes in time for Christmas. It’s a cute little story, and the kind that comics are so good at employing to tell heartfelt standalone stories. Buy it, but only if you have been reading up to this point. The characterizations are solid, I like the new status quo for Barry, and Williamson is building towards the epic Flash War. If you aren’t caught up, I don’t see you jumping right in at this juncture. 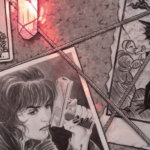 Williamson has been weaving a thread since the first issue that promises to deliver in the upcoming volumes.